The first graduate of the first Veterans Drug Treatment Court, Manny Welch, is living proof that anything is possible, that if the bad that life brings your way doesn’t kill you, you can overcome it and a lot more. You can reinvent yourself. You can go home again. Manny is a Vietnam-era Veteran who “used to live and lived to use” long after he left the military in 1979. Before he would begin the long road back from alcohol and drug addiction, he lost two families, four children, more than one job and his self-respect. Manny remarried – 24 years now – and has two children. His son, Manny Welch III, who attended the Justice for Veterans Conference with his dad, is now in college in Pittsburgh. Manny said he began his road to recovery after his introduction to the Buffalo Veterans Treatment Court, the first such court begun by Judge Robert Russell in January 2008. 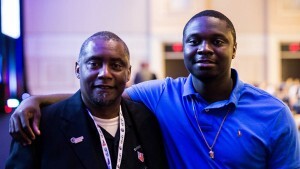 Manny Welch II and son, Manny Welch III, at Justice for Vets national conference. A drunken binge in 2008 following the death of his father led Manny back to jail and before Judge Russell, who refused to give up on Manny, and Manny’s transformation took its most positive turn. “The motto leave no Veteran behind is truly true, because (no one) would give up on me and they said, ‘You’re gonna do this and you’re gonna get through it,’” Manny recalled. Manny considers his greatest achievement graduating from the Buffalo Veterans Drug Court and is proud being the first graduate of the first Veterans Court. From there, he worked his way through VA treatment programs, right into a steady job at the Buffalo VA Medical Center. Along the way, Manny also got a degree from Erie Community College, a bachelor’s degree from the University of Buffalo and has risen to the position of peer support specialist. It’s a job he says he was always meant to have, “that God led me to.” He said every day he can apply his education and life lessons to help Veterans maneuver the turns and twists, fits and starts he encountered on his road to recovery.